In addition to the extensive education in nutrition that all doctors of chiropractic receive prior to their graduation, Dr.Bergamini has thousands of hours of study in this field since opening his first chiropractic practice more than forty years ago. 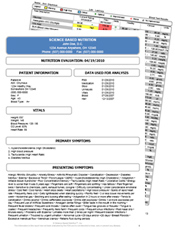 For several years he has been certified to practice Science Based Nutrition, an in depth analysis of the nutritional status of the human body developed by Dr. Van Merkle, Doctor of Chiropractic, holder of two board certifications in clinical nutrition, and vice president of the American Chiropractic Association Council on Nutrition. With the addition of nutritional consultant Porter Koury, Dr Bergamini joins the over a thousand doctors who for more than twenty five years have been offering Science Based Nutrition to their patients.